We LOVE our customisable wedding invites! Our state of the art design tool will help you create beautiful invitations for your event. Perfectly suited to your needs, our wedding invitations are designed to complement your theme and make your special day stand out. Follow 3 simple steps shown below and design your very own invitation cards. 1) Select the product from the menu bar and the variation that best suits your needs. We have gone for an A6 greeting card in this instance. 2) Start designing and get creative in our design tool, or simply select one of our pre-designed templates from the menu on the left hand side. You can edit the text and alignment as per your needs. 3) Preview your design, approve it, and add to basket. Simply check out once you have reviewed the items in your basket. Our customer is always our number one priority and we ensure your cards are printed and delivered to you within 3-5 working days. Did you know our folding business cards are often used as place cards for events? 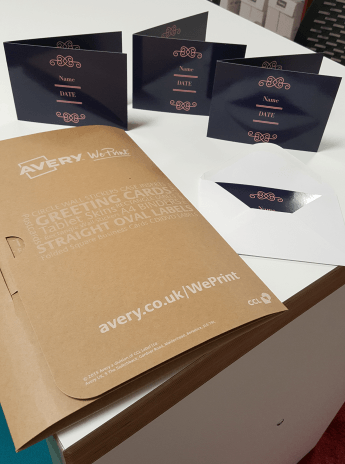 You can also create customised thank you cards, ring binders and personalised printed disks to make your special occasion even more memorable. View our complete range of products here.